More than a third (35%) of Hodgkin lymphoma cases in England are diagnosed via the ‘two-week wait’ referral route. Almost a third (31%) of Hodgkin lymphoma cases in England are diagnosed following a routine or urgent GP referral (but not under the ‘two-week wait’ referral route). More than 3 in 20 (17%) of Hodgkin lymphoma cases in England are diagnosed after presenting as an emergency. 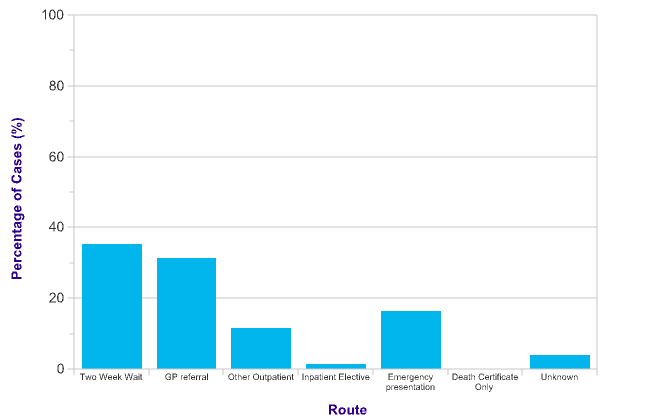 Around 6 in 10 (59%) of emergency presentation cases are via Accident and Emergency (A&E), with the other cases coming via an emergency GP referral, inpatient referral or outpatient referral. Data for Scotland is for lymphoma only.